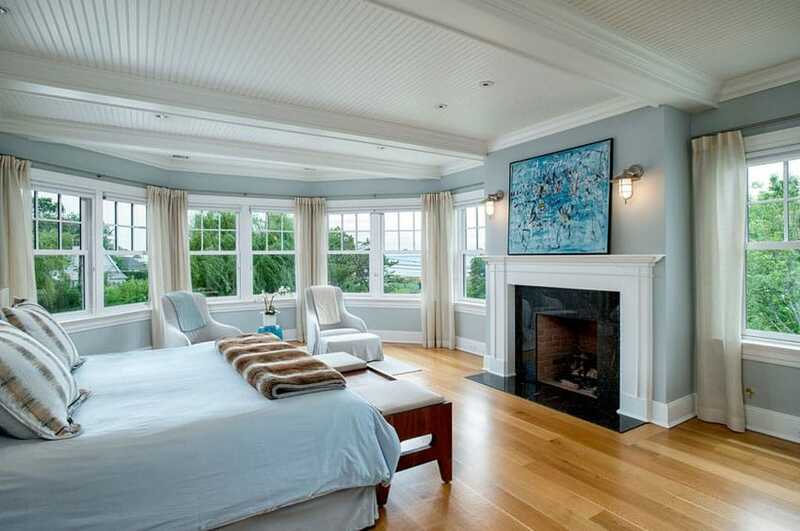 Welcome to our picture gallery of beautiful bedrooms with wood floors. The rich, warm look of wood flooring is highly sought after for use in luxury interior designs. Not only does wood flooring increase a home’s resale value it can help cut down on airborne particles that are often shed by carpets. 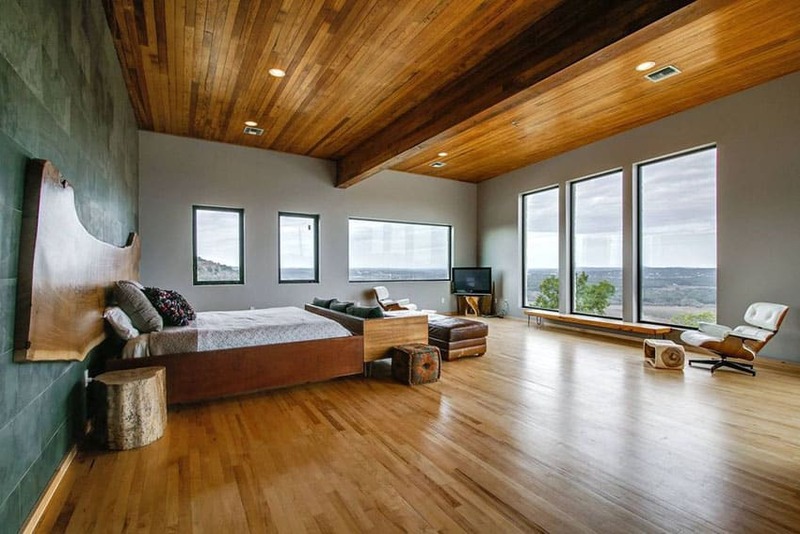 Below you’ll find a variety of bedrooms with wood floors to give you ideas for designing your own perfect retreat. In the image above natural elements come together with the clean, cool tones of this contemporary bedroom. Grey bed sheets and a mid century modern sofa in white upholstery are a good accent to the rough stone accent wall behind the bed’s Modern style head board and dark wood side tables. Hickory wood, a dark and hard wood type was used as the floor planks, and continues to the outside patio which features luxe outdoor furniture. There are many different options for flooring, ranging from hard, cool tile surfaces to the rich seamless feel of carpet and even to the retro, economical feel of vinyl. There is no better and more popular floor finish than wood. The reason for this is that wood is good at absorbing heat and sound, yet comes in a variation of rich colors, tones and grains, with some species being readily available locally, to others being top of the line luxury items. When using wood, one important but often overlooked aspect is to check if the wood being used is locally available. Aside from being cheaper and more environmentally friendly in terms of harvest and transport, choosing a local wood ensures that the wood specie is familiar with the particular climate and weather conditions of the region you want to build in. Some wood species can warp more than others when exposed to others, and others have better cold absorption properties, so besides choosing a wood because of its look and grain, how your wood floor can serve your home better is a good thing to know. Check out his page for our types of wood floors gallery with pictures. Oak – There are so many different types of Oak, that it is one of the most commonly used wood flooring, despite its large variation in look and texture. In fact, Oak is a great choice, as almost every continent has its own Oak specie native to them, so this fine-grained hardwood will always be a Classic option for wood flooring. Hickory – Because of its rough grain, Hickory wood is well known for its durability and is resistant to heat, sound and static charge. Just like Oak, Hickory comes in a variety of shades from a wispy whitish finish to a darker coffee brown. Hickory’s advantage over Oak is that it is cheaper, however, it is pretty high maintenance and does not thrive well in area with high foot traffic. Cherry – Known for its rich, warm tone, this wood is also know to evolve and turn a darker, richer shade as it ages. Because of this, Cherry is often treated to bring out a high polished finish, which brings out its fine, straight grains. Walnut – Also often used for large, heavy wooden furniture because of its beautiful ribbon grain, Walnut is also prized because of the natural color tone variation that can occur in a single board or plank. Usually of a richer brown tone, the natural Walnut grain is wavy and can come out in concentric knots. This type of wood is perfect for Contemporary bedrooms that want to bring in a more Classic or Vintage feel. Pine – Known for its yellowish tone and lightweight work-ability, Pine also features a lot of brown knots, giving it a rustic, cottage style appeal. Its biggest weakness, however, is that it is a softwood and is highly susceptible to scratching and even denting. This type of wood is becoming more popular again, due to the revival of Scandinavian style interiors, with pine wood planks being bleached or sanded further, to give it a more whitish or faded brown look. Exotic woods – There are many exotic wood species that have very interesting tones and patterns. Tigerwood, with its rich stripes, is also naturally resistant to mold and fungus as rot and decay. Another exotic favorite known for its black and white striations is Zebra wood, and is known to be resistant to insects, but could prove difficult to plane or surface largely due to its finely interlocking grain. One of the most popular yet hard to work exotic woods is Ebony, with a very fine grain and very deep black tone which can be polished to a high luster. Warm red oak strip flooring brings brightness to a rustic style cottage bedroom featuring exposed timber roof framing. All white walls and ceilings matched with white bed sheets are a good way to bring out the natural wood grain of the flooring, timber framing and wooden built up cabinet. It is also a good setup to the fireplace with mantel and low bench done with Classic yet simple ornamentation. 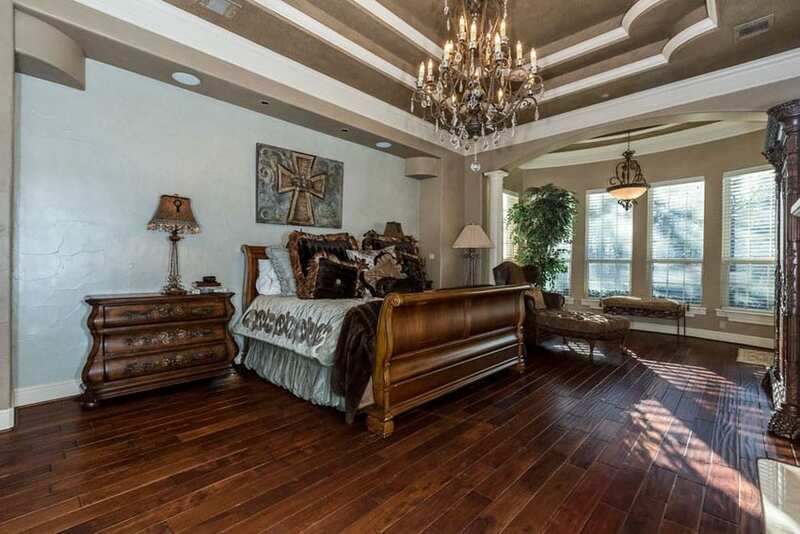 The whole room centers on a wrought iron chandelier over the large bed, also placed on top of a brown area rug. This very hip Manhattan style bedroom is surrounded by floor to ceiling black metal framed windows along its perimeter, complemented by its dark oak floor planks. 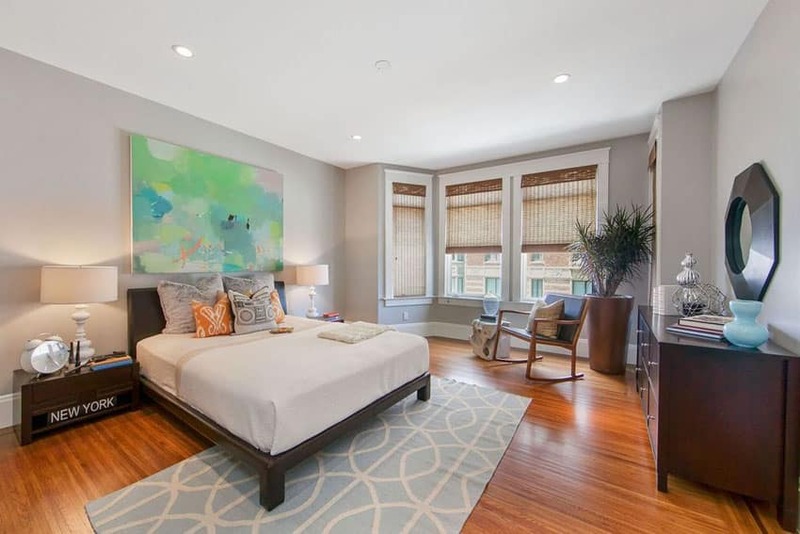 To balance out the use of dark metal and wood, white was the color used for the walls and ceilings, with off-white shades used for the bed, area rug and divan towards the foot of the bed. Gold accents, such as the small coffee tables beside the divan, are a good way to break up the room’s black and white monotony. This Minimalistic beach style cottage features floors that reflect the ceiling, using warm oak wood floor planks and ceiling strips. The warmth of the wood and its rich grainy texture is a good contrast to the light grey walls all around, seamless picture windows and grey ocean views. To add more texture, a dark grey stone tile was used for the accent wall, also a good way of showcasing the warm wood head board, bed frame and sofa set. Known for its unique grain and deep red-orange hues, Tiger wood is a durable, albeit highly exotic, choice for bedroom flooring. In this simple bedroom setting, the rich grain of the wood flooring gives drama in a room with plain dark wood drawers, bed frame and side table. The walls, bed sheets and lamp shades only need be a light beige, while the blinds are a simple rattan material. A light blue geometric area rug towards the foot of the bed gives the entire setup a more Contemporary feel. Known for its light color marred by large dark knots, pine is a good option for more cottage style setups, and can lend a rich country vibe to any bedroom. 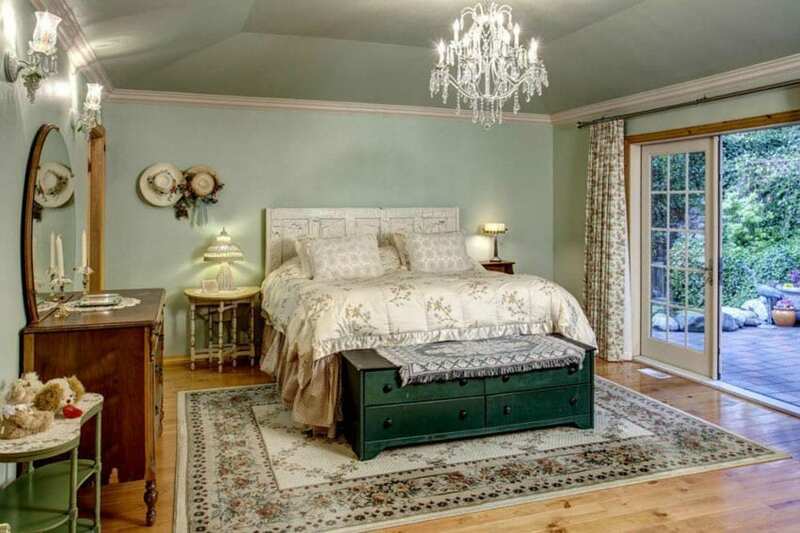 In this Classic style bedroom, the knotty pine wood goes well with the old style Persian carpet, low hanging chandelier and plump bed and duvet combination. The white wood sliding doors, as well as the mismatched Classic style lamp shades and wall sconces give this room a slightly eclectic feel. This classically luxurious bedroom features dark Maple wood floors matched with lighter off-white elements. Providing the base of the bedroom setup, the large black and white Persian carpet is the perfect base to white tufted upholstery and bed sheets set on heavy black painted wood furniture. A central black iron chandelier and large window behind the bed’s head board give this bedroom a slightly vintage feel. Bedrooms with wood floors can create a cozier environment by laying a large area rug around the base of the bed frame. Area rugs are also a great way to match the decor and color palette of the room to create a cohesive design. Dark oak floor boards run horizontally all along this gigantic beach house suite, and contrasts beautifully with the white stone tile flooring on the open air balcony. The ceiling cove is decked with different kinds of ornamentation and echoes the old classic luxury feel of this bedroom, as does the bed with its rusticated white wood and tufted white bed sheets. 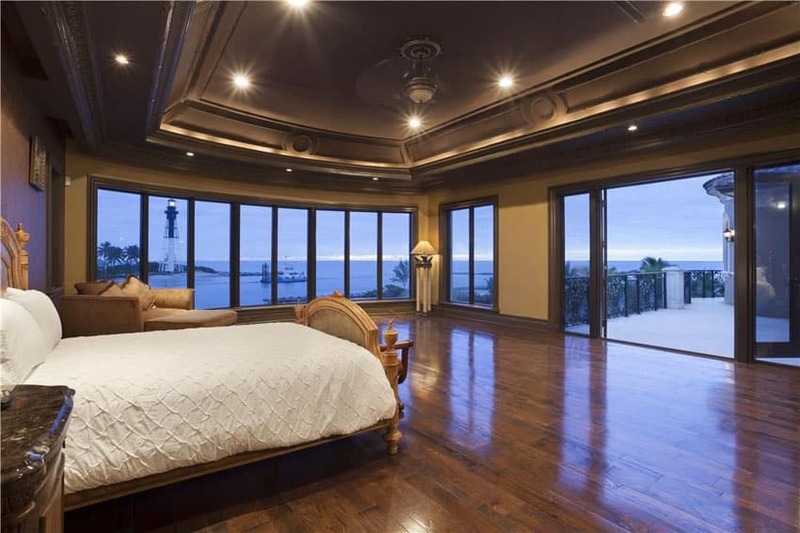 Floor to ceiling picture windows all around the room bring in magnificent ocean views. 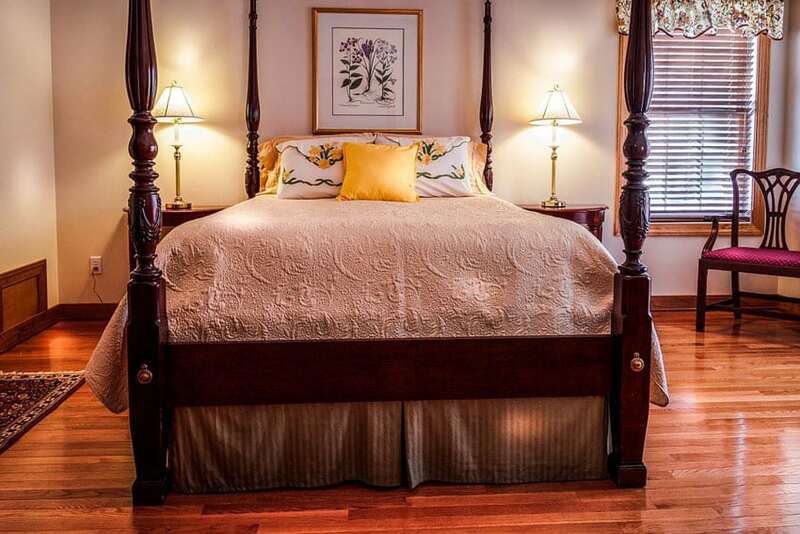 Hickory hardwood floors provide a warm yet heavy textured grain for this old style cottage bedroom suite. The rich color and grain of the floor goes well with the heavy wood furniture on the bedside table, sleigh bed and chaise lounge. The intricately carved wooden furniture are matched by the heavy brass chandelier over the bed and hanging pendant light by the bay window. Walnut wood comes in several different variations, but American walnut promises a light wood striated by heavy dark grain lines. Using this on the floor allows for an immediately rustic look, and in this case, is used in a neater rustic setting by matching it with white painted exposed wood roof framing, tan colored walls and door-height white painted wood recessed wall panels. The use of vintage furniture such as the old rose colored bed sheets, black velvet armchairs and Ottoman, and silver ring chandeliers go well with the Contemporary vintage look. Light grey walls match well with the white sloping ceiling and a solitary hanging chandelier over a rich brown upholstered bed with pristine white sheets, guarded by a pair of tufted Ottoman chairs at its base. A yellow and white geometric area rug cuts across the bed and stands out through the use of a dark Walnut wood for the flooring. A geometric bedside table in white with classic lamp shade gives the room a Minimal Eclectic feel, with its use of geometric profiles in lighter neutral colors. This Master bedroom suite starts with a decadent lounge area with a grey velvet Lawson sofa fronting a central Ottoman above a rattan weave rug. A pair of white pillars supporting a linear architrave separates the lounge from the main bedroom, which features a massive bed with chevron pattern side tables and held together by a large diamond pattern rug. The bedroom culminates with a sloped cove ceiling with a gold lamp shade candelabra at the very center. 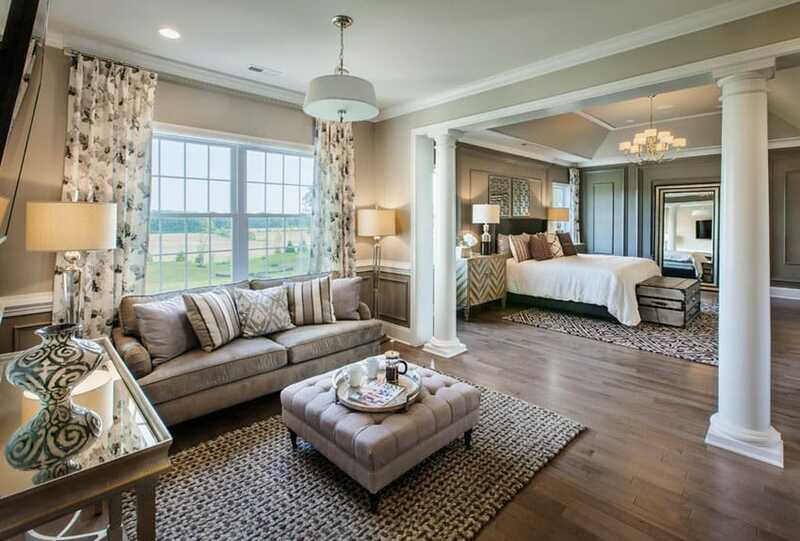 The whole master bedroom suite features a continuous wooden flooring using a pale brown-grey Scandinavian wood. 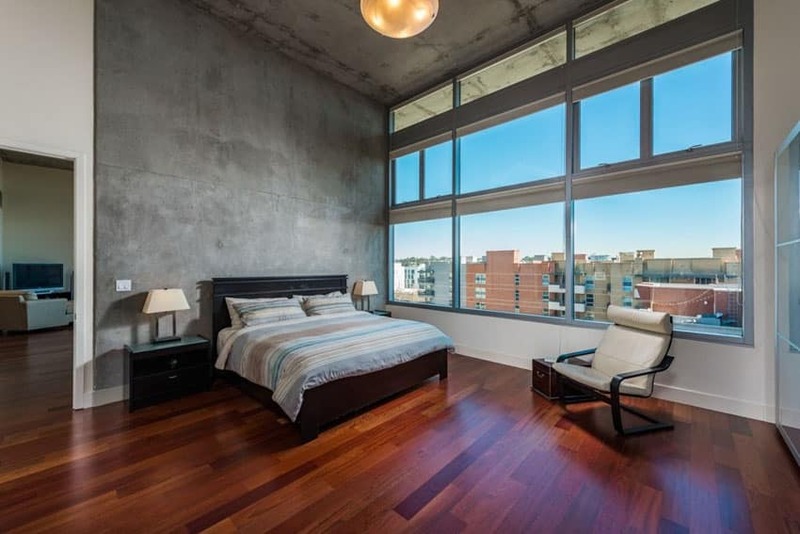 Industrial style concrete walls and ceiling give this master bedroom an inner city vibe, going with the Modern landscape outside of the large metal framed picture windows. Dark wood is used for the bed frame, side tables and lounging chair, while white is the accent for the chair’s leather upholstery and lamp shades on either side of the bed. To tie the whole look together and for a warmer accent, Brazilian cherry wood was used for the floor boards, perfect for their warm tone and fine grained surface. This traditional Plantation style bedroom features a light grey base color for its walls and ceiling, accented by the white painted carved wood four poster bed frame, chaise lounge and door and window trims. Luxurious white linen is used for the bed sheets, as well as the upholstery for the chaise lounge and reclining armchair. To balance out the room’s lightness, a dark shade of fine-grained Walnut wood was used for the floor boards. The whole room is illuminated by an orbital style black iron and crystal chandelier. This Classic style master bedroom features wide planks of Hickory flooring—known for its light brown tone and mild striations with a few deep black knots. The rustic look of the wood goes well with the white walls and ceiling, as well as the white wood framed French doors leading out to the outdoor balcony. A more traditional bed head board and side tables match the large armchair with footrest, while the geometric grey and white rug give the room a more Contemporary feel. Red Oak flooring gives this traditional style bedroom a warmer, more energetic feel, as it matches well with the darker wood used for the elaborately carved four poster bed, side tables and lounge seat. In this example, traditional bed sheets, lamp shades and curtains are also accented by pops of yellow in the bed’s throw pillows. Light yellowish wood floor planks are a good choice for a bedroom with much cooler tones. With light blue-grey walls, white bead board ceiling, and white linen sheets, the simple use of a yellowish wood gives this bedroom more vibrancy. As the centerpiece of the room, the black stone tile fireplace mixed with red brick is highlighted by its white painted wood. A Neoclassical style mantle lit by a pair of hanging wall sconces in stainless steel provides a more vintage profile. The hexagonal bulkhead to the side features a series of double hung windows that bring in light and a suburban view best enjoyed from the pair of slump armchairs separated by a vibrant blue coffee table. 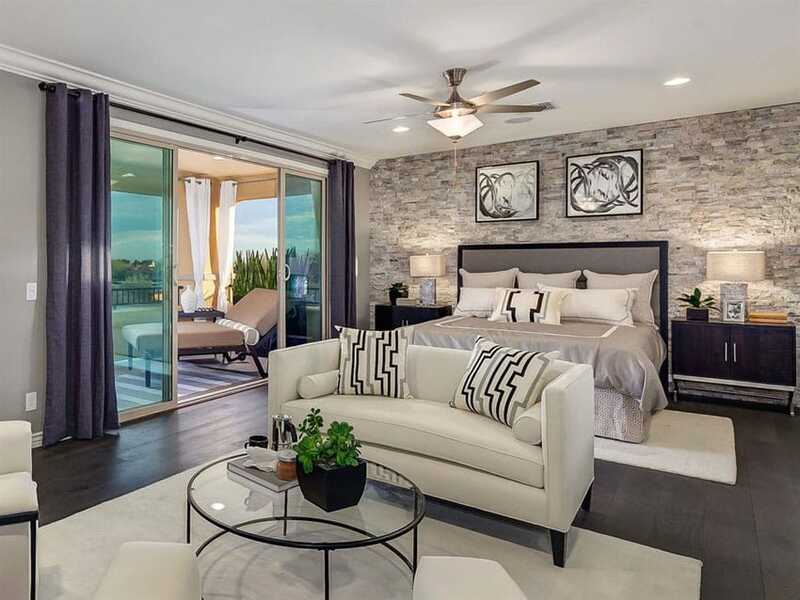 Bedrooms with wood floors such as the one featured above create a timeless elegance that will increase the home’s resale value and help brighten the living environment.